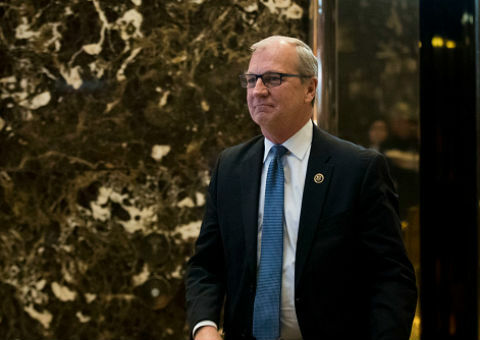 Democrats jumped to attack a campaign reimbursement claim from Rep. Kevin Cramer (R., N.D.) and his wife that they drove 3,000 miles this year, but fact checkers determined the Cramers did, in fact, drive the claimed amount while campaigning. Democratic candidate for North Dakota attorney general David Thompson filed a complaint with the Federal Election Commission regarding the Cramers' claim. Cramer is challenging Sen. Heidi Heitkamp (D., N.D.) for her Senate seat. "Implausible mileage reimbursements to Kevin and Kris Cramer: The campaign’s reimbursement of $1,152.75 to Rep. Cramer and $531.38 to Kris Cramer for first quarter mileage expenses is highly unusual and almost implausible," North Dakota Democrats claimed. However, a fact check by the Associated Press shows the Cramers actually did drive the 3,000 miles and filed correctly. The AP determined Kevin Cramer drove more than 2,300 miles and his wife, Kris Cramer, dove 975 miles separately. "It’s not only plausible, it’s true. North Dakota is a big state (69,001 square land miles) and Kevin Cramer is its only U.S. House member," the AP reports. "Cramer did drive more than 2,300 miles according to an AP analysis, which mapped the locations to substantiate the mileage and also checked with event organizers and media reports to verify Kevin Cramer’s attendance. The mileage reimbursements he and his wife made to themselves were correct." Most of the events traveled to were local Republican events, but there was also a 420 mile car trip to Fargo for an event with Vice President Mike Pence and a 210 mile trip for a local Republican convention in Dickinson. "The Cramer campaign said he uses the standard mileage rate, set by the Internal Revenue Service, of 54.5 cents per mile to determine his reimbursement," the AP reports. "That means Kevin Cramer was justified in drawing $1,152.75 from his campaign to cover mileage costs." This entry was posted in Politics and tagged 2018 Election, Fact Check, Heidi Heitkamp. Bookmark the permalink.